In the most recent episode of Parks enforcement drama at Dolores Park, we’re learning about the destructive power of inappropriate napping. Libertin isn’t going to take this lying down. He’ll contest the $192 ticket, as he contends that his sleepy Saturday afternoon was (a) not malicious and (b) not damaging to the tree. In fact, the straps he used to hang the hammock are specifically considered “tree friendly.” Moreover, he went back and photographed the trees a day later to show how conspicuously intact they remain. 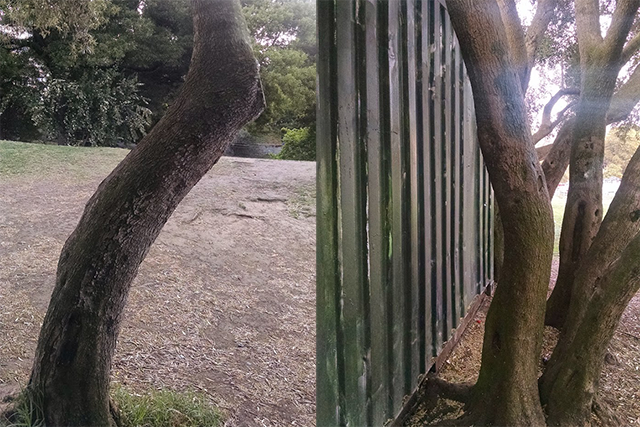 Libertin has done a little independent research about the kind of trees (olive) he was hanging out between and found they are particularly resistant to wear and tear, but has also emailed a professor of forestry for further information. Photos courtesy of Michael Libertin. But to some extent it’s also a matter of principle. So, is is it actually against the rules? A representative from Rec & Park was not immediately available for comment on the question of potentially malicious hammock-hangers. But as we’ve learned from the aforementioned Facebook video of an argument about the legitimacy of bringing tables to the park, household items or structural alterations are not permitted in the park. According to parks code section 4.06, climbing or lying on trees is also prohibited in the parks. Slackliners have also run into trouble with parks enforcement before. Only balloons, signs, piñatas, streamers and “etc.” are expressly forbidden from being affixed to trees. For his part, Libertin says he certainly wouldn’t have hung the hammock had there been signage indicating a rule against it. For now, he says he’ll probably hold off on hammock-lounging, at least in Dolores Park. Libertin said he understands the efforts to make the park more kid-friendly, reduce littering, and discourage illegal activity – but isn’t clear on what that has to do with his naps. UNBELIEVABLE. Pay your fine and quit your entitled whining! Dolores Park is not your personal playground. These people are making me wish the park was closed once and for all. No, it’s not a personal playground, but it IS a public park, paid for with our tax money. Fines make sense for destruction of public property, but a hammock? Are blankets destroying the grass or runaway frisbees maliciously ripping leaves off the trees? 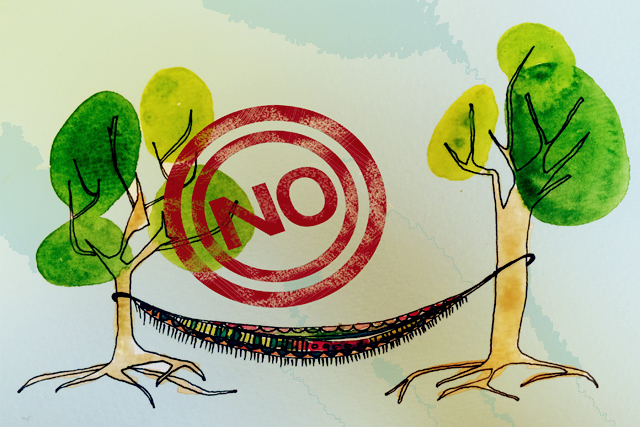 Come on, in what would would you want people to be fined for napping in a hammock in a park? If kids are not allowed to climb the trees, I don’t know why twenty something year old Google engineers feel entitled to nap in them. We don’t need signs all over the place laying out the rules, we need adults to stop acting like spoiled brats and use a little sense. The case in point here is that the Parks Code 4.05, prohibits “malicious defacement, damage or destruction of real or personal property.” is expressly stating the word, “malicious” in the code… The hanging of a hammock, or climbing of a tree itself, is not malicious. In fact, the city has to prove malice and malicious intent, along with defacement, damage and/or destruction of the property. If the city, and parks and rec department can not prove malice, which the burden is completely on them, especially since there are photos that show no destruction, to prove that the person involved and cited had intent of maliciousness and intent to destroy or deface the property, then the case and ticket holds zero water and no fine. This type of proof has been challenged by riders of Muni who’s clipper card did not properly tag, and were cited. Per those rules, the clipper and Muni terms expressly used “malicious intent” as to why a fare evading would result in a ticket. The agency must prove not only maliciousness in the person, but that the person who used a clipper card, had intent to not pay, let alone combined in one event. The case I read, had the ticket thrown out because neither the agency, Clipper or the judge or officer could prove the person who was fined not only had no intent to pay (considering there was money on the clipper card but did not read on the machine), but that the person was malicious and had ill will toward the agency to not pay. Same case here – the burden of proof is on the city and parks to prove that the person had not only malice to deface and destroy but also the intent to do so, even if they were a maliciously defy the code, if they didnt deface or destroy, the case is thrown out the window.